I try to list every certificate I can find for every railroad in North America. 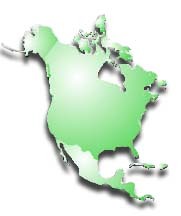 "North America" includes all the land mass north of the coast of Colombia, including the Caribbean islands, Hawaii and Greenland. This area encompasses 23 countries and several British, Dutch and French protectorates. Catalog numbers are assigned to certificates based on company name, I maintain a list of every railroad and railroad-related company I have ever found reference to. Regardless of origin, companies that operated (or intended to operate) outside of North America are beyond the scope of this project. However, if foreign companies laid track anywhere in North America, or were otherwise involved in North American railroading, I try to include them. Of particular note are Dutch stock-holding consortiums that were very instrumental in American railroad finance. Please contact me if you specialize in non-U.S. countries and have special knowledge of rail companies in your area of interest. I particularly need help with Central American countries south of Mexico. Here in a census of all railroad companies recorded in North America as of Wednesday, April 17, 2019.